The Easy Panel system can be used in any project where underfloor heating is required but there is limited build up height available. These can vary from new builds through to older renovation projects. Easy Panel is available in foiled or unfoiled versions for use with aluminium heat spreader plates. The panels are supplied pre-grooved to accept a 16mm pipe that pushes into the grooves during installation. Once the pipe has been installed, a structural floor must be installed over the top which can include; tongue and groove chipboard, screed replacement boards, real or engineered timber. Depending on the grade of board used the Easy Panel system can be supplied in boards between 25mm and 80mm thick. Building regulations will advise you of any insulation thickness requirements for your project. 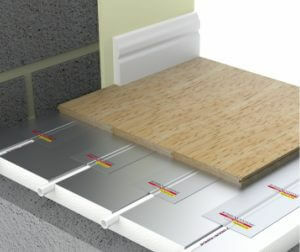 If additional insulation is required then it can be placed under the Easy Panel to increase the insulation values. Once the Easy Panel has been installed then a suitable floor covering needs to be installed over the top. This is usually around 18mm - 22mm for engineered or real timber, screed replacement boards or tongue and groove chipboard. If it is an existing floor then particular care must be taken to ensure that the floor is flat and clear from dirt and debris. After the pipe has been installed a foil tape needs to be laid along the main runs of pipe to help transfer the heat to the floor. After this has been done, a polythene vapour barrier must be laid across the entire floor and then the floor deck can be laid.